Today the Red Sox affiliates played the Rays affiliates: Triple-A and Double-A were home, and Low-A and High-A were in Port Charlotte. The Lowell Spinners had a five-inning simulated game. I had to make a lot of tough decisions regarding this day. Mike Antonellis told me that the minor league games had been canceled yesterday because it was supposed to rain; though it never did. I was a bit hesitant in making the drive because there was a 60% chance that it was going to rain today, and I didn’t want to drive all that way for nothing. Weather reports are rarely accurate, anyway, so I decided to take the risk. But then I had an even tougher decision: to go to the last game ever played at City of Palms Park, or to go to my last minor league spring training games of the season. I don’t doubt the fact that I will be back at the complex for extended spring training as well as my fair share of Gulf Coast League games; but it was my last minor league spring training game ever at the complex. Minor League Spring Training is the paradigm of intimacy. But I can already tell just from hearsay that I won’t have the same kind of access that I do now at the new complex. The players are quite accessible now. Some of the pitchers sit in a covered area and watch the game and hang out; some hang out in the bleachers; and some just gather behind home plate to chart and collect foul balls.The only thing preventing me from picking their brains about all the intricacies of pitching and hitting is my respect for their personal space. The last thing I want to do is be invasive. They’re always willing to give me an update on how they’re doing, though. I went to the minor league complex because that’s where my heart is. I feel a personal connection with a lot of the guys because I’ve had the chance to talk to them. I always talk about how I find the “human element” of the game to be so interesting, and I have really had the opportunity to see that a lot this spring. They tell me about their struggles, and I know major league players struggle too, but I think it’s different for a minor league guy. They haven’t made it yet. Many are experiencing failure for the first time; many are trying to perfect their mechanics and adjust to a new level of pitching at the same time. They don’t have the comfort of a multi-year, multi-million dollar contact. When these guys go 0-4 in a game; when they give up 4 runs in an inning; and when they make errors, it’s not for lack of effort. The majority of the minor league players were there a good two weeks before their official reporting dates. They work their butts off every single day. They’re supposed to make errors; it’s all part of their development. They need to fail in order to learn how to succeed. I could talk about their work ethic forever, but I have some relevant updates from today. -I heard that Brandon Workman and Chris Hernandez will start in Greenville, though this is neither certain nor confirmed. Everything about rosters is educated speculation at this point. Workman was disappointed with his first spring outing, but he was pleased with his outing yesterday: he threw four innings of no-hit ball. I think starting in Greenville would be good for both of them, and I don’t expect either of them to be there for long. -Ryan Khoury, who fouled a ball off of his calf last Friday, said he was feeling better. -I caught up with Jason Garcia a bit. He was drafted in the 17th round of the 2010 draft. He lost 15 pounds in the off-season and added some velocity to his fastball. He is now topping out 93-94 mph rather than 90-92. He pitched in the Gulf Coast League after signing and had a 3.03 ERA in his 29.7 innings. He has been pitching with Greenville a lot this spring, and hopes to start there. -I spoke to Jose Iglesias a bit, too. I was really impressed with how good his English is. This is only his second full year in the United States, and his English is better than my french–and I’ve been taking French for six years. (The lineup actually didn’t look like this at all; but I suppose it doesn’t matter because it was a simulated game). I saw Swen Huijer and Jacob Dahlstrand pitch for Lowell. Huijer had a good outing and pitched to contact. Dahlstrand struggled a bit with his placement, which led him to leaving balls over the plate, and hitters were taking advantage of it. His off-speed stuff looked nice, though. 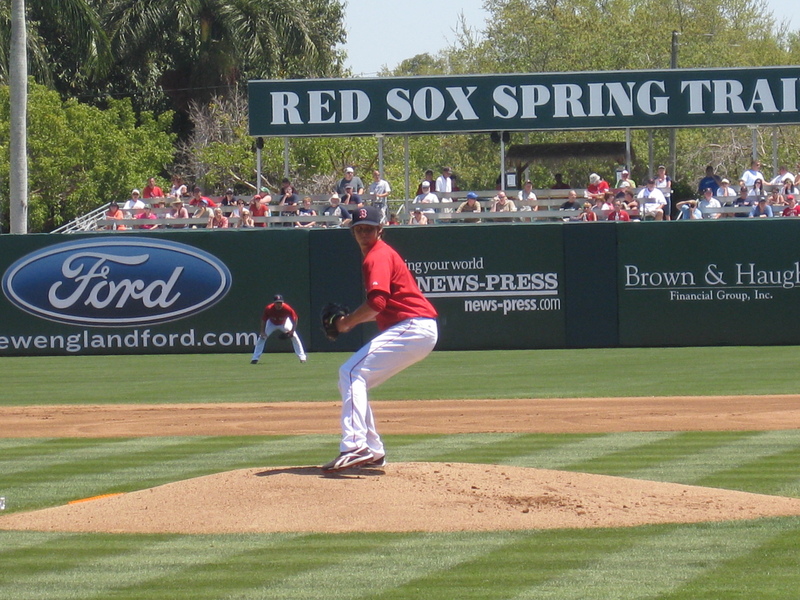 Felix Doubront started the game for Pawtucket. It is still uncertain whether he will head north with Pawtucket or stay in extended spring training for a bit because his preparation for Opening Day was slowed due to elbow discomfort. He gave up no earned runs in his two innings of work. I was going back and forth between games, but I did see that at least Yamaico Navarro and Ryan Kalish had multi-hit games. Josh Reddick and Lars Anderson both had singles. Juan Carlos Linares hit a home run. Michael Bowden also didn’t give up any earned runs over his two innings of work. I didn’t see his second inning, but in his first inning of work, he walked the first batter, induced a fly ball, and then a 6-4-3 double play. Bowden only has one minor league option left. I know that he can be effective in the ‘pen, so I hope the Sox use him wisely. Chris Carter was sporting a mohawk and playing for the Rays’ Triple-A affiliate. Dan Hoard noted that he is better suited for the American League, so he can DH. 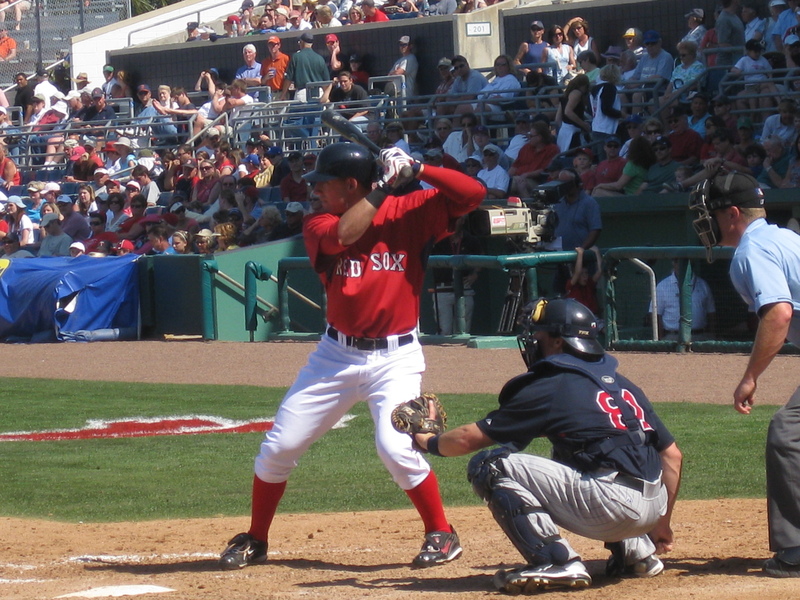 Originally drafted by Arizona, Carter spent three years in the Red Sox organization. I discussed where Weiland might start the season with Dan, and he speculated that he could be their fifth starter. Antonellis said that this was likely and that Caleb Clay will probably be called up to Portland. It is also relevant to note that Clay shaved his mustache. It was really nice to catch up with Dan. He has been nothing but welcoming to me when I have come up to Pawtucket. He went through Syracuse’s Newhouse program as well, so it was really nice and encouraging to talk to him about that. In the Portland game, Mike Antonellis notes that Tommy Hottovy pitched really well. Will Latimer, Dennis Neuman, and Justin Erasmus all pitched as well. It was great to see Erasmus get a taste of Double-A experience. He pitched the last inning, and threw 13 pitches, nine for strikes. He induced three fly balls to get the save. Ryan Dent came in to play shortstop for Portland, so I would say he starts the season there. 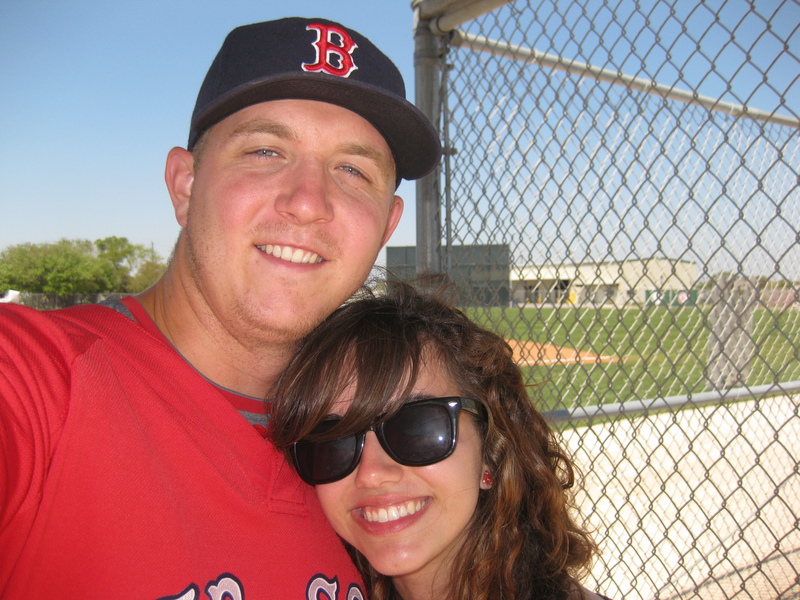 For more Red Sox Double-A coverage, read Mike Antonellis’ blog, and follow him on twitter. For more Red Sox Triple-A coverage, read Dan Hoard’s blog, and follow him on twitter..
For extensive Red Sox minor league coverage, visit SoxProspects, and follow the staff on twitter.. I hope to be back at the complex on Saturday. The schedule says that it’s a camp day, so I’m assuming that there will be a workout. That is essentially the last day for players who will be assigned to a full-season affiliate. I had a great time at minor league spring training, and I’m truly going to miss it. It was great to be back at the Red Sox’ Player Development Complex after a week without it. The more I go; the more lost I feel when I’m not there. It was an unusually foggy morning–even when I arrived at the complex, but it cleared up by the time they started infield drills. Bryce Brentz and Derrik Gibson were taking early morning outfield and infield drills, respectively. Ryan Khoury fouled a ball off of his left calf yesterday (3/25). He didn’t play today, and he will rehab tomorrow. He should be back within the next few days; it’s nothing too serious. Kyle Weiland is still working out with Pawtucket, and he started for them today (not sure about his line; I got there late). It is still unclear as to where he will start the season. I think it all depends on whether or not Alfredo Aceves sticks with the big-league club in relief, or starts the season in Pawtucket’s rotation. It seems like Aceves is likely to start the season in Pawtucket with Matt Albers and Dennys Reyes sticking with the big-league club. Weiland certainly is capable of making the jump to Pawtucket now, but I don’t think spending a little more time in the Eastern League will hurt him. Ryan Dent continues to workout with Portland, and he has been in their lineup rather consistently so far this spring. With Iglesias as an essential lock for Pawtucket, Dent could fill the shortstop hole in Portland. Dent is fantastic defensively, but he still has some work to do when it comes to his offense, which is obviously normal at this stage. I asked Renny Parthemore how he was doing in passing, and he said that he felt a lot better. He had a frayed labrum last year and did not play. I had the pleasure of interviewing Lucas LeBlanc, who was drafted in the 11th round out of Delgado last year. 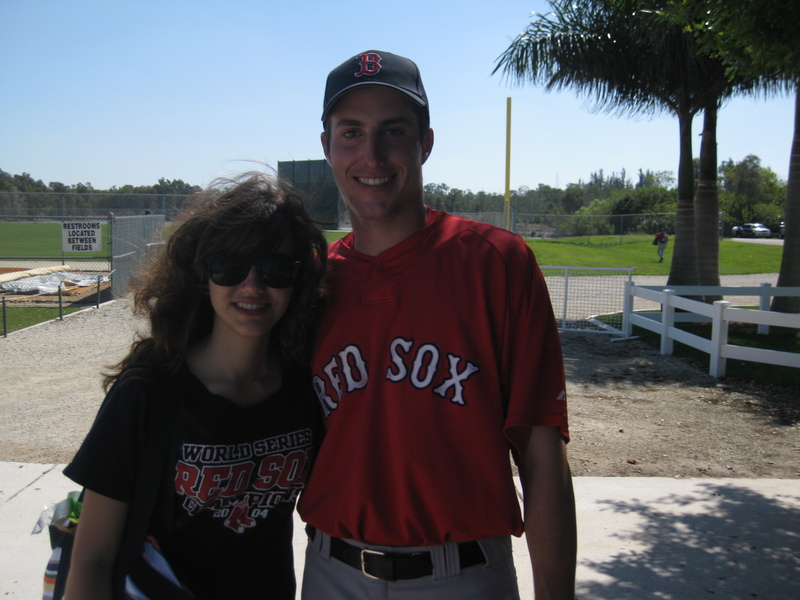 The interview will be on SoxProspects within the coming weeks, so I will post a link to that here when it’s up. LeBlanc also played for Triple-A today. *John Killen (I think he was the starting pitcher for them, but I’m not sure). Wilson P, followed my Michael Lee, and then Will Latimer. 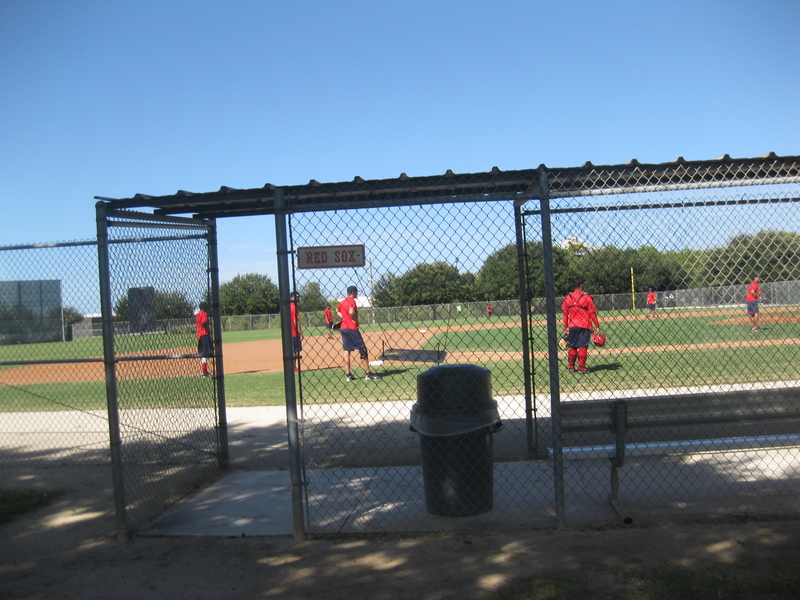 Because the Red Sox affiliates were playing the Twins affiliates, I was able to split my time between the two complexes. I watched Drake Britton pitch two innings, then watched about an inning of the Greenville game, then drove over to watch Portland and Pawtucket. Drake Britton was absolutely lights out. In his first inning of work, he struck out the side He threw 14 pitches, nine for strikes. He struck out the first batter he faced on three pitches. In his second inning of work, he threw 12 pitches, eight for strikes. He pitched to contact more in that inning, inducing two ground balls and striking out one. At one point, Britton missed high three times in a row, but then threw three straight strikes. He has this one offspeed pitch that has incredibe movement that was fooling batters all over the place. I think it’s a curveball, but I’m not sure. Derrik Gibson was hit by a pitch in the elbow. The trainer came out to see him, but he stayed in the game–at least for a bit. He took a couple of free swings behind the dugout after that inning with the trainer, but I didn’t see if he got back in or not. I watched the Greenville game for about an inning, and I had the pleasure of meeting Sean Coyle’s girlfriend, Elizabeth. She informed me that Sean hit a single and stole two bases. She also talked about his great work ethic. I didn’t know that the players have to get to the complex around 7 am to hit in the cages. Jason Garcia started the Greenville game. He gave up two home runs (when I was watching), but he was probably just leaving the ball up in the zone. He was drafted last year in the 17th round, and only played in the Gulf Coast League, so it’s impressive that he’s playing with Greenville. Daniel Nava had his foot wrapped up on the trainer’s table when I got to the Twins’ complex. I don’t have any details, though. Mike Antonellis, the radio broadcaster for the Portland Sea Dogs, informed me that Ryan Lavarnway absolutely crushed a ball for a home run. Oscar Tejeda also hit a deep double. With Federowicz and Lavarnway both slated to start the season in Portland, it will be interesting to see how their playing time is divided. At this point, Lavarnway’s bat is more advanced, and Fedrowicz’s defense is more advanced. That being said, Lavarnway could take on a more DH-heavy role. I had the pleasure of hanging out with Mike for the majority of the game. You can follow him on Twitter here. Mike is really one of the most genuinely nice guys I’ve met, and he is really someone I admire and will try and emulate. He has a great rapport with all the players, and he has a great understanding of how things work. He has really been so helpful to me over the past year, too, and I can’t express how grateful I am. He and Chris Cameron let me write game stories when I was in Portland, and he also let me interview Luis Exposito for the radio. Having those first-hand experiences were really invaluable. This spring, he has let me do freelance writing for his blog and the Sea Dogs website. I really appreciate everything so much. As much as I have enjoyed getting to know the Red Sox prospects, I have also really enjoyed getting to know, or at least meeting prospects from other teams. I ran into Twins pitcher David Bromberg again. He was their minor league pitcher of the year in 2009. He will be pitching on Monday. Another prospect I have enjoyed getting to know a bit is Brandon Henderson, a pitcher in the Rays system. He was drafted in the 15th round last year. In nine games in the GCL last year, he went 3-0 with a 1.59 ERA. He scattered 13 hits over 22.2 innings, striking out 28. He last pitched on the 24th, and gave up his first unearned run of the spring. He went two innings with one walk and one hit. He is definitely a pitcher you should keep your eye on. I should be going back on Tuesday. I have tickets to the major-league game, which will be game played there. These tickets are courtesy of Helen, whom I had the pleasure of meeting at the major-league workouts. Somehow, though, I am tempted to stay at the complex and watch those games. **Update** Tyler Wilson and Hunter Cervenka pitched in an intrasquad game on Sunday. Jon Lester was the opposing pitcher. Tyler Wilson threw 14 pitches over two innings, yielding no walks, no runs, and striking out one. This information comes from Tyler’s mother, Pam. Clearly, I’m not cut out for using any kind of technology besides a computer. I bought a new toy last weekend from Best Buy: an audio recorder. This past weekend at the Red Sox’s Fall Instructional League I was able to get two interviews, and I’ve already managed to delete one of them. You see, I had done a test recording of nothing to make sure I knew which buttons to press. So, at the end of the day I had three files on my small, silver toy: a “post-game interview” with starter Jacob Dahlstrand, the most useless file in the world, and an interview with the next top outfield prospect in the Red Sox organization, Reymond Fuentes. Guess which one I deleted? The last one. I’ll do my best to paraphrase what he said, but I won’t put words in his mouth. Don’t get me wrong, I had really great conversations with both Dahlstrand and Fuentes because they were both very open and friendly, but I do feel like a recorder takes something away from the conversation. I think what I’ve learned this year is that there is a fine line between an interview and a conversation. I always say that I like to interview players, but really, I enjoy having conversations with them because it’s so much easier for me to hear the human element of baseball, which is really the angle I’m going for in my career (?) at this point. I know that I’m going to have to use recorders when I start writing professionally, but instead of interviews, I want to have conversations. The recorder is small enough that I could stick it inconspicuously in my back pocket, but that’s probably unethical and perhaps even illegal. Once again, I had no idea what I was in for this past weekend. I’ve never heard of a baseball game being played earlier than 12:05 pm, but I guess there’s a first time for everything. This game started at 10 a.m. If I wanted to be there on time, that meant I needed to leave my house by at least 7:30. Of course, I wanted to be there before the game started, so that I could get situated, so I left my house at 7 am, which is earlier than I typically wake up for class. I had never been to the Twins complex before, but it was hard to miss, and very well organized: it includes the Minnesota Twins major league spring training facility (Hammond Field) as well as five or so fields for the minor league teams. There is only one problem I could possibly see with this kind of facility. I would have to pay some ridiculous sum for parking even if I was not going to the major league game. I didn’t have to this time, though. I arrived about 15 minutes before game time, and I followed a group of scouts into the complex. I was the only female there for a while. From what I can tell, the Fall Instructional League does not have to follow typical baseball rules. The Red Sox had 10 people in their batting lineup: two designated hitters. They could also bat out of order without any penalties whatsoever. If someone grounded out, they could get another shot if they needed to. This made score keeping nearly impossible, so I gave up after a while because I was so confused as to why Ryan Dent was batting again when I could have sworn that he had just gotten to first on an error from the shortstop. I don’t even know what the final score was. In other words, these games are designed merely for players to get their work in. They don’t want to see Ryan Dent get on base because of an error because that’s going to happen less and less as he advances from level to level. They want to see him get on base because he gets a hit through the gap. Around the second inning, I transferred to the bleachers behind home plate to see a different angle of the movement on Dahlstrand’s pitches. It was here that I had the pleasure of meeting and speaking with Jason Garcia, who was drafted in the 17th round (533rd overall) of the 2010 draft. He had pitched the game before, so he was on charting duty from what I could tell. He said he was happy with his outing, and that his fastball was working for him. He hopes to be in Lowell next year. I enjoyed his often facetious commentary on the game. I went back to my original spot because I had trouble seeing over the pitchers sitting in front of me with the radar guns. Here is some of the stuff that I noted from the game. -Jacob Dahlstrand really used the outside corner well, but he needs to incorporate other parts of the plate as well. -John Killen was topping out around 90 according the the various radar guns around me. He did have some command issues, but I think those could be easily fixed if he slowed it down a little bit because it seemed like he was rushing his pitches. He definitely has good movement on his pitches, so once he refines his command a bit, and finalizes his arsenal, his offspeed stuff will be nasty. I think I might have seen a splitter and a curveball, but I’m horrible at judging what kind of pitch it is. One thing I think he needs to focus on is not getting frustrated. -Sean Coyle has a really nice swing, and a fairly good eye from what I could tell. It looks like he struggles a little bit with the offspeed stuff, but that’s completely normal at this stage. His infield mechanics are nearly flawless, quite possibly the best I saw that day. -Christian Vazquez had a solid pickoff throw. -Tyler Wilson had a quick delivery and an impressive fastball that was fooling guys all over the place. -Felix Sanchez was fouling a lot of pitches off, which I think is indicative of a good eye and solid plate discipline with some minor issues in timing. Jose Iglesias (soon heading off to the Arizona Fall League), Bryce Brentz, and Miles Head each connected for a double. Brentz actually had a multi-hit game. Others probably did as well, but as I said, I stopped keeping score. One of the reasons I stopped keeping score was because I kept getting distracted by conversations/interviews. I interviewed Jacob Dahlstrand right behind the dugout. He had a big ice pack on his shoulder. Here are some of the highlights. Dahlstrand was born in Houston, roots for the Rays, and his favorite player is Josh Beckett. His repertoire includes a fastball, a curveball, and a changeup, which he is pretty happy with right now. He wants to work on his fastball command because that has been his biggest challenge so far. Pitching from the stretch is starting to get easier for him. The reason that it is so hard for pitchers is because they don’t have to worry about pitching from the stretch in high school since they never put anybody on base. He was drafted out of high school, and had he not signed, he would have gone to the University of Houston and probably majored in business. He only played two games in the Gulf Coast League this year because he stressed something in his back. Reymond Fuentes had played the day before, so he had the day off today. He agreed to an interview after the game, and he certainly held his word. He is originally from Puerto Rico, and his favorite player is his cousin, Carlos Beltran. He looks up to him a lot, and he works out with him in the off-season. Fuentes skipped Lowell (short season-A) and went straight from the Gulf Coast League (rookie league) to the Greenville Drive (Single-A). He said he was really happy about that. His biggest challenge so far has been the long season. He played 40 games with GCL, and in his very next year he played significantly more. His goal for this year is to stay healthy. He attributes his greatest strength to his legs because he has a lot of speed, and he would like to stay in center field for his career. I don’t think Fuentes is on a lot of people’s radars quite yet, but he is certainly someone to keep your eye on. I think that he has a lot of potential, and I would not be surprised to see him in the Red Sox outfield in 3-4 years. turns out to be only a three week program. This is coming weekend is the last, and I will be touring Syracuse, Northwestern, Marquette, and University of Wisconsin-Madison. The deadline for early applications is quickly approaching, and I have a big decision to make as to where I want to apply Early Decision, if at all. I had a really fun time at Instrux, and I can’t wait to see these guys during Spring Training, or maybe before if they’re there earlier. I swear, every time I go to a baseball game, I don’t really have any idea what I’m doing. I go to baseball games with the sole purpose of interacting with at least one player, but it’s not like I have some strategic plan that I follow each time I go to a baseball game. To be honest, going to baseball games has become kind of a stressful experience (in the absolute best of ways) for me because I never know what to expect going in. The outcome is certainly worth the uncertainty. The Fall Instructional League is essentially a rookie league populated by guys from the Dominican Summer League, the Gulf Coast League, and the Lowell Spinners (short season Signle-A ball). In other words, there are a lot of draft picks. This is absolutely raw, unrefined baseball talent, and this league serves to refine essential baseball fundamentals. Many of the draft picks signed late, so they have little to no experience in professional baseball–maybe nine games in the Gulf Coast League (a rookie league). The only guys who weren’t at the Fall Instructional League on Sunday when I was there were Anthony Ranaudo and Brandon Workman. Workman was to arrive the next day for a slightly different strength conditioning program. There was very little information regarding the Fall Instructional League. There were some rumors regarding who would be there. Casey Kelly, Ryan Dent, and Ryan Westmoreland all confirmed via their Twitter accounts. An actual roster was posted a few days before the league began by Sox Prospects. This helped me out because I was able to do some basic research, and perhaps more importantly, figure out where these practices (and games) were taking place. The only thing it didn’t tell me was what time everything was taking place. I basically had to blindly assume that the practices would start some time between nine and ten. All I could hope was that I was not embarking on a five hour round trip for nothing. 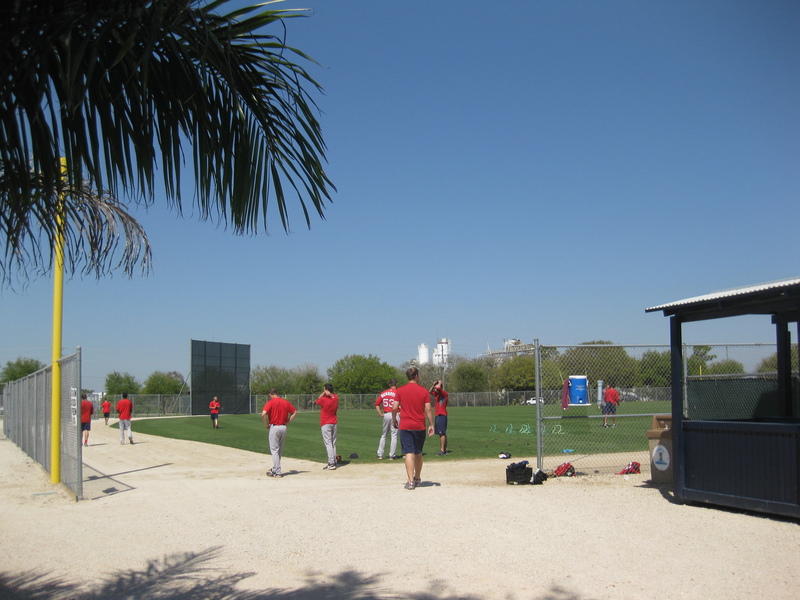 As I drove into the Red Sox Minor League Complex–a place I had not been to for five months–I noticed a sea of red uniforms a couple of fields over. The grueling two-and-a-half hour drive over boring alligator alley suddenly became a small price to pay. I was absolutely enthralled from the moment I set foot upon the complex. The majority of the players were gathered on one field, focused on an intricate drill that focused on what I would call situational fundamentals. The coaches would yell out a situation. “One and two with two outs,” for example. The pitcher would pretend to throw home, and then the coach would hit the ball somewhere. It was up to the players to adjust accordingly, and make the call as to what should happen. The coaches would get angry if the players weren’t communicating with each other. The players would switch out nearly every play, and then would wait in line until next time. This was far from fundamentally sound. In fact, first base was overthrown more than once, and the cutoff man was occasionally missed. This observation is not meant to criticize–far from it. This observation made me realize the point of this league: to refine the fundamentals. As I said before, a lot of these guys have little to no experience with even the lowest level of professional baseball. This league is to prepare them for it. On the other fields, the pitchers were working on pick-off drills. This was perhaps my favorite drill of the day because I had never seen anything like it. Even though I have heard from more than one pitcher that pitching from the stretch is something that is far from natural, I had no idea that this was how they learned. I assumed that it just came from in-game practice, but these guys were working on both how they turned and their pick off throws. It was absolutely fascinating. I was very patient when it came to talking with players. I did not want to be rude and interrupt their practice, so I waited until they were at least en route to another field. I was familiar with names, but unfortunately I was not as familiar with faces. I decided not to risk embarrassing myself by addressing somebody by a name that was not his own, so I ended up asking for everyone’s name. I hope that they weren’t offended that I didn’t know exactly who they were or what they had done up to this point. Most of them were extremely friendly. I suppose the chocolate peanut butter cupcakes didn’t hurt. 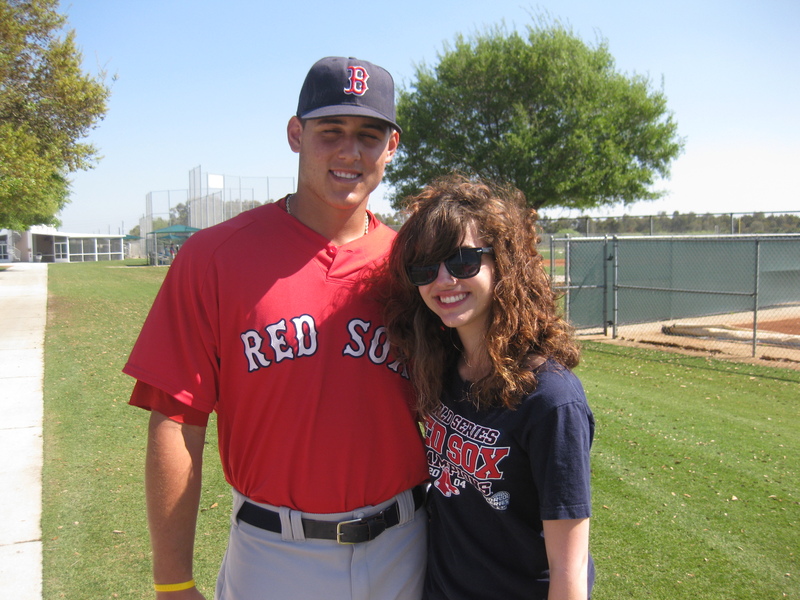 The first guy I talked to was Garin Cecchini. I did not get a chance to talk to him for a long time because he was en route to another drill. He said he was really happy to be there, and I could tell that he was absolutely thrilled. He had only played about nine games in the Gulf Coast League, so he was clearly there to get more experience under his belt. He was wearing a brace around his knee, and I noticed that he was experiencing some pain during the infield drills. He said that he had had surgery recently, but he felt fine. I’ll ask him more next weekend. Then I talked to Lucas LeBlanc. He hasn’t played in any GCL games because he signed so late, but he had played in a summer league. He was committed to LSU following the draft, but chose to play professionally. He said that he still had some angry voice messages and text messages saved on his phone. He had no regrets, and he said that he was really happy with his decision so far. I had the longest conversation with Sean Coyle, and we spoke for about five minutes. He is a utility infielder, but projects to play second base in the organization. He likes to hit first or second in the batting order, and is confident with his speed on the base paths. He is projected to go to Greenville next year, and played very briefly in the GCL. I asked him the biggest thing he has learned so far and he said to just stay relaxed. He said that he anxious a lot this year (understandably so) and that he just needs to relax and take it easier. He also mentioned that he had played in summer leagues for the past four or five years with wooden bats, so the transition hasn’t been too hard. His brother is currently at UNC-Chapel Hill, which is one of the schools I’m applying to. I missed a couple of the players going in after batting practice, but some stayed behind to kill a snake and tie it to a bat. Miles Head was kind enough to pose for a picture with his prize. The last guy I talked to was Bryce Brentz. He is a pretty funny guy. Since he was drafted out of college, I also brought up the difference between aluminum and metal bats. He said something to the effect of that the outfielders are able to position themselves better when it comes to hits off wooden bats. That’s something I had not heard before. ound it kind of odd that I had bought an audio recorder the day before, yet I didn’t use it once that day. I didn’t even ask for a picture with any of these guys. I guess it just did not feel right at the time, and I’m glad that I didn’t. Sunday was a day for me to put myself out there, and merely introduce myself to the players. It would have been awfully awkward to whip out a recorder and tape these informal interviews. I’ve decided that I only want to use the recorder during a formal interview or a press conference. Otherwise, I feel like the presence of a recorder would take something away from the conversation. Overall, I was impressed–not with their fundamentals, but with their attitudes. From what I could tell, they were all very driven and ambitious. I could tell that it was absolutely surreal for the guys who didn’t have professional experience yet. I’m sure this feeling wares off after a while, but it was just a pleasant ambiance to be a part of. They have a game against the Twins (at the Twins) next Saturday, and I will be going back. I plan on scoring the game, and I will sit next to somebody with a radar gun and track pitches. I would also like to conduct a formal interview with one of them (or all of them), if they oblige. Hopefully I’ll get a chance to look into the strength conditioning program as well. I am also hoping to get a chance to say hello to Ryan Westmoreland, who is also rehabbing. I didn’t see him on Sunday because I think he had gone in relatively early. I think it is absolutely remarkable that he is there, but I have to say, I’m not surprised. The second he got out of surgery, he pretty much had himself convinced that he was going to be back on a baseball field, and he has worked hard to make it happen. Judging from his tweets, he seems absolutely thrilled to be there, and that’s all that matters. After all the fun that I had during Spring Training talking to some of the best Red Sox prospects, how could I not keep up with them during their respective seasons? From Single-A to Triple-A, I’ve been keeping up with these guys. The Lowell Spinners (Single-A) do not start their season until June, and I’m pretty sure that a lot of them are still in Florida at the minor league complex (I might just have to go back). I will start with the Greenville Drive, the Single-A team in South Carolina (not that far of a drive, right?). This team includes prospects like Derrik Gibson, Reymond Fuentes, and Jeremy Hazelbaker. He started off the season pretty strongly, but he seems to be in a bit of a slump right now. He spent his entire season with Lowell last year, so I think that this might just be a small adjustment period. I have no doubt that he will be a big contributor for this team. I think the same goes for Fuentes and Hazelbaker. Fuentes was in the Gulf Coast League last year, and Hazelbaker was in Lowell for the most part. It’s the beginning of the season, and these guys are in the next level of the season. It’s normal that they are adjusting. The Red Sox might have a 3-4-5 combination of the future with the Salem Red Sox. Anthony Rizzo, Ryan Lavarnway, and Will Middlebrooks have been tearing up the Carolina League. Rizzo is a fantastic clutch hitter, and has already collected eight RBIs on the season. Ryan Lavarnway leads the Carolina League with his powerful bat, collecting 21 RBIs, and has hit five home runs already. Middlebrooks also has eight RBIs with seven doubles. Tim Federowicz is a player to keep your eyes on. He is another great catcher that the Red Sox have in their minor league system, and he has also collected eight RBIs on the season. Pete Hissey and Ryan Dent have also been hitting well. Stolmy Pimentel is 2-0 with a 2.30 ERA. Remember how Lars Anderson had a “disappointing” season when he advanced to Double-A last season? Well, he is back and better than ever! He is batting .321 with four home runs, five triples, and 12 RBIs. He has only gone hitless once during his last ten games. Luis Exposito has collected 10 RBIs, with two doubles and a home run so far this season. Despite having only one RBI, Jose Iglesias is able to get on base pretty consistently. Remember this is his first year in professional baseball. He never played in Single-A. Ryan Kalish has three home runs, seven RBIs, and a .391 OBP. As far as pitchers go, Felix Doubront is 2-0 with a 3.21 ERA; Stephen Fife is 1-1 with a 2.51 ERA; Casey Kelly is 0-0 with a 1.08 ERA (he is on an inning count so he hasn’t gone more than 3.1 innings). Kyle Weiland struggled in his last start, but has pitched well otherwise. Eammon Portice and Tommy Hottovy have both been solid in relief, and TJ Large, who just joined Portland, worked 2.1 innings of solid relief last night. The Pawtucket Red Sox are having Star Wars Day today. Star Wars and minor league baseball are pretty much my two favorite things in the world, so it deeply saddens me that I cannot be there. Darnell McDonald was tearing up Triple-A, so his call up to the show was appropriate, and he certainly made an impact (which I’ll get to later). Aaron Bates and Daniel Nava have both been hitting very well. Josh Reddick was struggling at the plate, but I honestly think that comes from how far he got during Spring Training. He’s on the 40-man roster, but he was pretty much the last man in Spring Training to be sent down. Even if he knew it was coming, that has to be very hard. He was also called up to the show recently (which I will address later). Michael Bowden has pitched effectively in his starts, though he hasn’t been getting much run support. Adam Mills’ last start was absolutely incredible: he pitched five shutout innings. Robert Manuel has been a star out of the bullpen. In nine innings over seven appearances, he has yet to give up a run. Dustin Richardson has also been effective out of the ‘pen. He is a lefty, so I think he will be up very soon. Kris Johnson has struggled out of the bullpen, but I think we have to remember that he was a starter last year. Now he is a reliever, and that’s a pretty big transition. I think it was a smart move to make him a reliever, but still, that transition takes time. On another note, Ryan Khoury is up with Pawtucket, which is great, but he hasn’t been getting many at-bats. I hope he gets more at-bats; he deserves it! With the unfortunate injuries to Jacoby Ellsbury and Mike Cameron, some of my favorite prospects had their chances to shine. The five game losing streak that includes sloppy playing and terrible situational hitting prompted me to stage a hunger strike. I did have to sneak a bowl of cereal in the morning because I felt like I was going to faint. It was Darnell McDonald who allowed me to eat again. In his debut in a Red Sox uniform, he hit a home run to tie the game, and a single off the monster to win it. I have known the name Darnell McDonald since the spring of 2009 when he was playing for the Reds. Walk off wins are always fantastic, but they’re even better when they come from prospects (in my opinion, at least). Josh Reddick also collected a two run double that night. He has already been sent back down, but I think he should have gotten more playing time. Although he is not used to the monster in left field, I think he can still provide better defense than Bill Hall can because Reddick has an incredible arm. And although he has a powerful bat, he is also good for small ball purposes because he is a great bunter. I have no doubt that Reddick will return soon. Jonathan Van Evry has returned to the Red Sox. He started with the Pirates this Spring, and he was part of that amazing triple play against the Pirates. I’m glad that he has returned. He has done really well for the Pirates’ Triple-A affiliate, and I think he can serve the Red Sox well. the Red Sox, and the White Sox have all had back to back walk off wins. While the first of the Red Sox’s walk off win was definitely cause of celebration, it was not the cure. Think about who had all of the RBIs: Jeremy Hermida, Josh Reddick, and Darnell McDonald. Either a bench player, or minor league call ups. We still weren’t getting production from the everyday lineup.That has started to change as of late; the Red Sox are starting to be more productive with runners in scoring position. Someone whom I didn’t address with Pawtucket was Daisuke Matsuzaka. Dice-K has been very effective for the Pawtucket Red Sox. He only walked one batter in his three outings. His excessive walks have characterized him the past two years. He will be added to the Boston rotation this week, and Tim Wakefield will be going to the bullpen. I think this move is smart. Wakefield is a versatile guy, and he provides the long-term relief that we have been lacking in the bullpen. Having a knuckleballer coming out of the ‘pen who can go 2-3 innings is quite valuable. His knuckleball simply hasn’t been effective in the starting rotation, though I think part of that comes from rushing to get the ball to the plate because so many runners steal on him. I also think this is a good move because Buchholz simply does not belong in the bullpen; he belongs in the rotation. *Update after finale to Orioles series* Wakefield’s knuckleball looked great today, and he should have been able to finish the seventh. His knuckleball was effective today, but like I said, he could be really valuable out of the ‘pen. You have hitters who are used to seeing fastballs in the 90’s with spin, and then suddenly, a guy comes in throwing knuckleballs. And since he is a reliever, opposing hitters won’t be able to tie him down. This could work. Despite Buchholz’s latest loss, he still turned out a stellar performance; including a career high ten strikeouts. I think that Terry Francona has to be a little more conscious of when to take his starters out. He always waits too long. When it’s the seventh inning and your starter has just put two men on and is over 100 pitches, it might be time to take him out. Finally I want to address David Ortiz. After constant frustrations and struggles, Francona finally pinch hit for him, and even kept him out of the lineup for consecutive days. Ortiz is despondent, embarrassed, and frustrated among other things. I have no doubt that he is trying his hardest, but sometimes it is simply necessary to bench players despite their efforts if they are not being effective. After being benched for two games, Papi responded with a home run in his first at-bat off of Jeremy Guthrie. Again, this does not mean that everything is OK, but it is an improvement from last year’s home run drought. I think the fact that he was pinch hit for signals the start experimentation at the designated hitter position. We are going to see a lot of different lineups. The finale of the Orioles vs Red Sox series is going to start in about 20 minutes. While I wait for the game to start, I would just like to share with you the latest baseball statistic. There is a fascinating negative correlation between the start of baseball season and my grades (especially Physics). This is especially remarkable in Physics because afternoon games tend to fall around the same time that Physics does. Not to mention I hate Physics almost as much as I hate the Yankees. I didn’t think Spring Training could get any more intimate than City of Palms Park. Autographs are more of a commodity than they are during the regular season, and no matter where you sit (from my experience, at least), you’ve got a pretty nice view. I thought that way until I decided to take a left on Edison Avenue rather than a right, and I was headed down to the Players’ Development Complex. I could have just gone to the ballpark: making vain attempts at getting autographs, and getting the “give me a second” finger from the more renowned stars. I had been pretty comfortable with doing that in the past: I knew the best places to get autographs, and even if I only got a couple, it was still fun talking to the fans I was with. I decided to step out of the box when I went down to the complex, and do some exploring. I didn’t really know what to expect down at the complex. I had only been there once before when it was the common practice to go down there and watch the workouts. There were hundreds of fans, but it had been an incredible day nonetheless. This time, the only people walking around the complex when I arrived were the players. I was armed with a batch of delicious oreo cupcakes that I thought the players, staff, and security guards might appreciate considering it had probably been weeks since they have had homemade goods. It didn’t take long for me to feel right at home at the complex: as soon as I walked through the gate and onto the premises, Dustin Richardson gave me a warm welcome. He asked how I was doing, and he even asked me about this website, which he mentioned he had checked out. He was interested in my cupcakes, but declined on one until later. There was a practice on every field, so I strolled around taking it all in. I don’t know why, but I felt it would have been weird to take pictures. It just didn’t feel right; I felt like it would have been invasive. We had a bit more time to talk, so I finally told him my name so he would know me as someone other than glasses girl. I also ran into Casey Kelly for a quick second, and I complimented him on his fantastic start against the Rays earlier in the week. Then I had the chance to meet Stolmy Pimentel, a highly ranked pitching prospect in the organization. I had a nice time talking to him, and his favorite pitcher is Erwin Santana. I also had the chance to meet Juan Apodaca (his brother, Luis, plays for the Rockies). He was really nice as well, and his favorite catcher is Pudge Rodriguez. There was a big bus in the parking lot for the Single A guys, and I noticed Pete Hissey getting on. He was kind enough to stay and talk for a second. I mentioned to him how impressed I had been with him when he had come up, and I gave him one of my cards. Ryan Khoury told me that the icing on the cupcake that I gave him was fantastic. Robert Manuel thought they were muffins, but hey, close enough. I also had the chance to talk to Gil Velazquez, who remembered both me and my father from last time. He is rehabbing his broken thumb right now. As I said goodbye to Ryan after talking to him for a bit, I told him I’d be in Portland during July and August, but instead of telling him that I hoped I would see him there, I told him that I hoped that I wouldn’t see him there (because hopefully he’d be at the next level). Towards the end of my day there, I had the pleasure of meeting Mike, Kim, and their adorable daughter Elizabeth. They are from Greenville, SC, and it was a pleasure meeting them! They go to nearly every game in Greenville, and they are great baseball fans. We left with about fifteen minutes to game time, and let me tell you something, we had the most incredible seats in the world. We were in the first row behind the Red Sox dugout, thanks to John Ruzanski, a security guard in both Fort Myers and in Pawtucket. John is such a great guy, and hopefully I’ll see him over the sumer in Pawtucket. The field was even more breathtakingly beautiful from these seats. John Lackey looked pretty good in his final start of the Spring. 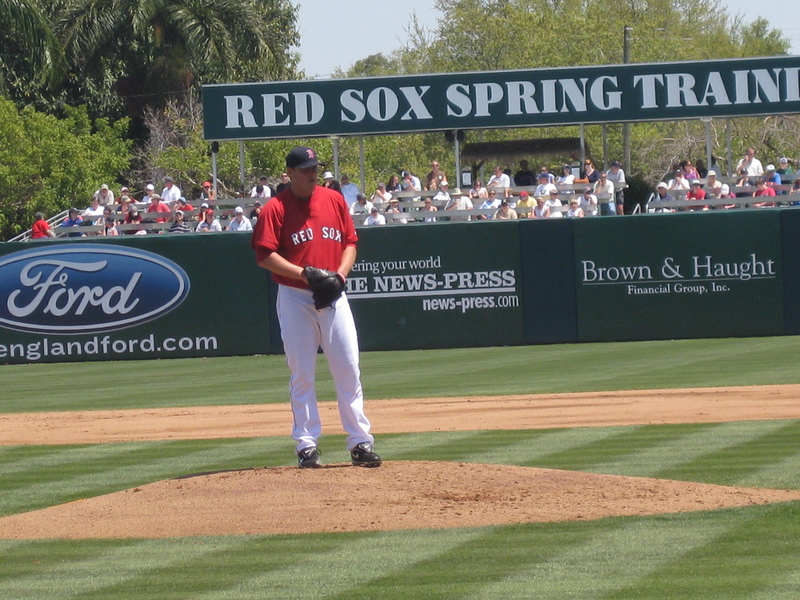 It was pretty cool to have seen him in his first start in a Red Sox uniform, and his final tuneup before it counts. After allowing a second inning home run to Jim Thome, Lackey pitched a pretty decent game. Manny Delcarmen, on the other hand, struggled. He lacked both his command and his control, and he hit two batters in his 1.2 innings. 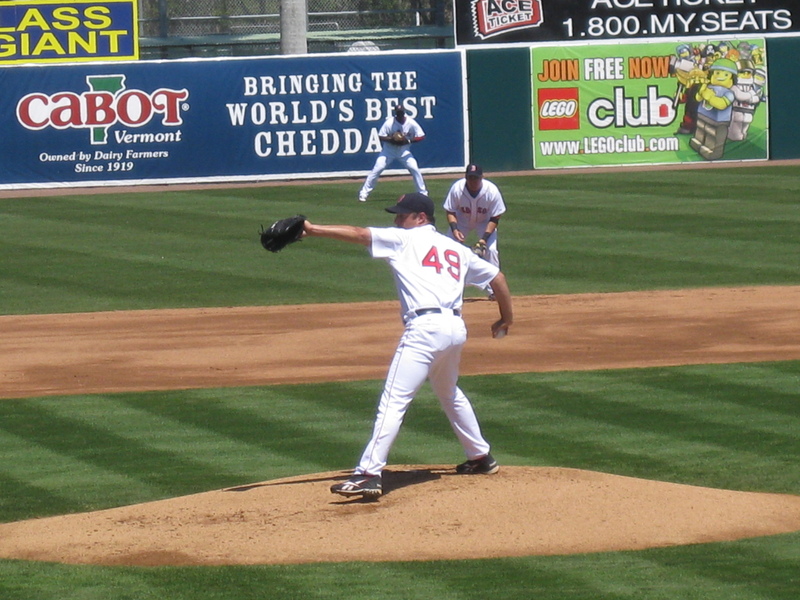 Scott Schoeneweis picked up the win, and he looked really solid in his outing. It was my projects who made the difference in this game. They always make me proud. I had seen Ryan Kalish earlier at the complex, so he must have been a last minute call-up. It was so great to see him there though, and he had a nice bloop single. The ladies sitting behind me gave Nate Spears a great nickname: the Nate-er-ator! The Nate-er-ator had a tie-breaking RBI triple. Since it was Spring Break, my dad and I were able to go to two games in a row, and we spent the night in Fort Myers. That didn’t mean there wasn’t an early wake up call though. City of Palms Park may open at 10:30, but the complex opens even earlier. How could I not go back after the day I had had there? The coffee provided at our hotel tasted like brown water, so we stopped at Dunkin’ Donuts before heading to the complex. We arrived so early that players were still walking out. I had the pleasure of meeting Dave: a security guard for the Sea Dogs. It was great talking with him. As I continued to walk in, Ryan Dent asked why there were no cupcakes today. I watched the Pawtucket Red Sox warm up on their field, and I ran into Kris Johnson. He will be starting the season in Pawtucket, and we are both on a quest to make sure we spell analysis correctly in the future. 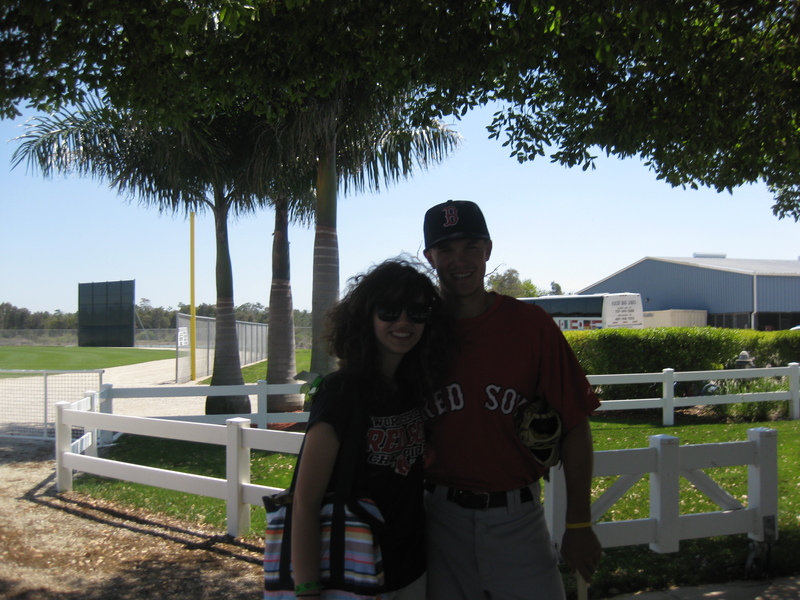 I also told him that I hoped I wouldn’t see him in Pawtucket when I was there. Then I walked over to where some of the Single A guys were doing drills, and I told Anthony Rizzo that he was a project of mine. He asked why, and I told him I would explain later because I didn’t want to interfere with the drills. When I caught up with him (and told him about my project program) later, I also had the pleasure of meeting his mother, Laurie. I had the chance to meet Ryne Miller as well. He was the guy that made the emergency start when Beckett was out with the flu. He told me that they told him at 11 am on the same day. That isn’t fair to anybody, but he certainly did not make any excuses. Brock Huntzinger was pitching in a Single A game that day, and we talked for a bit. He is from Indiana, and has been with the organization since 2007. He was a really nice guy, and I look forward to watching him during the year. He had to take the picture since I was too short. Then I had the chance to meet Derrik Gibson, and we walked across the complex talking. I found out he is from Delaware, which is where my mother was born, and I still have lots of cousins over there. It was great to talk to him, and I told him that he is a project. I ran into Dustin again, and I had a nice chat with him walking across the complex. I told him that if I had it my way, he’d be in Boston right now, but I really liked what he had to say. Instead of just saying, something like, “Yeah, I should be in Boston”, he said that he still had stuff to work on in Pawtucket. That really showed me how meticulous he is being with his approach. 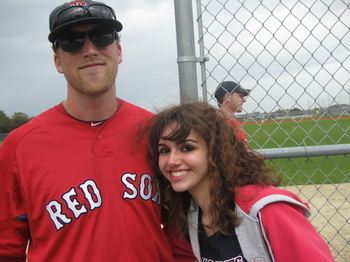 Still, I told him I hoped I wouldn’t see him in Pawtucket when I’ll be there. I also caught up with Michael Bowden a bit more extensively,and it was great talking with him. Like I’ve said before, he will be up in Boston real soon, potentially even by the time I’m in Boston. He said if he wasn’t that he would be in the stands like last time. Then I had the pleasure of meeting Cesare Angeloni, and he showed me how to throw a splitter. He is from Philadelphia, so he grew up a big Phillies fan. He played in the Gulf Coast League and in Lowell last year. He’s really nice, and I look forward to watching that splitter this year. Finally, I ran into Pete Hissey again. He told me that if he wasn’t playing baseball, he probably would have gone to law school. He is primarily an outfielder because he is left handed, and left handed guys can’t play the infield (I had never even thought of that!!). With all these guys I’ve met, I’m making a couple additions to the projects. Add Derrik Gibson, Ryan Khoury, Pete Hissey, Cesare Angeloni, Ryne Miller, Adam Mills, and Stolmy Pimentel to the list. Then it was time for the final grapefruit league game of the season. I’m sure a bunch of the players are sick of Florida, but the ending of spring training is bittersweet for me. I’ve had an unforgettable time down here. After a shaky first inning, Clay Buchholz pitched a fantastic game. His only problem in the first inning was that he was getting a bit distracted by the runners. It was not only great seeing him, but also meeting his wife, Lindsey. She is so nice, and I wish her and Clay nothing but the best. 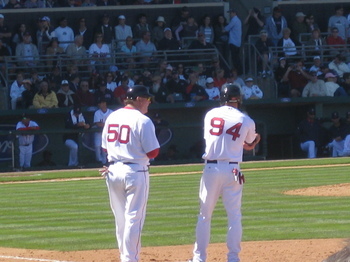 It was great to see a bases clearing double from Jason Varitek (and from the same, incredible seats as well). It was also great to see Reddick get a hit to finish off an incredible spring. Kevin Youkilis even threw me a ball! Sitting behind the dugout, you can hear a lot more things: like the profanities coming out of Dustin Pedroia’s mouth as he comes back into the dugout after getting out. Too bad he hasn’t signed my salsa yet. As I bid farewell to Spring Training, I have to give a couple of shout outs. First and foremost, to Merrill, a season ticket holder for both spring training and the regular season. He has been helping us out with tickets since 2008, and he is such a nice guy to watch a ball game with. Another big shout out to Tom, a security guard at the park who helps out the handicapped people. It was great seeing him all Spring. The pursuit of happiness is priceless.